An area that I feel Morningside is currently lacking is the availability of help resources for faculty and instructors that are tailored for Morningside faculty and readily available. This is one of the areas I hope to address early in my time in my position as Educational Technologist. It will take time for this library of resources to be built. Here is a list of resources that we currently have available to us as well as a list of resources I hope to create over time. Moodle help for students: eClass4learning is a 24/7 helpdesk. Moodle help for instructors: Moodle Reference Desk. Has some basic information about setting up a Moodle page. I intend to work with IT in getting this knowledgebase more expanded. Right now it is a bit sparse. Help desk for general technology issues. Create a series of short videos demonstrating some common issues with Moodle and Taskstream. Lists of free or inexpensive programs with possible uses in the classroom. List of gadgets available for loan and possible uses. Morningside Educational Technology website as a central resource point (in progress and not yet live). This entry was posted in Ed Tech Resources on August 17, 2015 by christopherson. It’s August…where did the summer go? Setting up Moodle Courses. Well, July has passed into August. Where has the summer gone! If you are like many faculty, this turn of the calendar signals the time to begin prepping for Fall semester courses. Getting syllabi written, course schedules set, assignments decided upon, and areas to focus on for improvement are just a few of the items that begin to fill out time during this month. Another is getting our Moodle courses ready for the fall. This blog entry will focus on some of the nuts-and-bolts of getting your course up and running and ready for the Fall courses when they begin. I’ll cover the following topics 1) setting up the course itself so that students are auto-enrolled, 2) options for organizing the Moodle page for your course, and 3) things to think about in terms of how you plan to use Moodle in your course. In this next screen you will need to enter in some specific information from Campus Web. 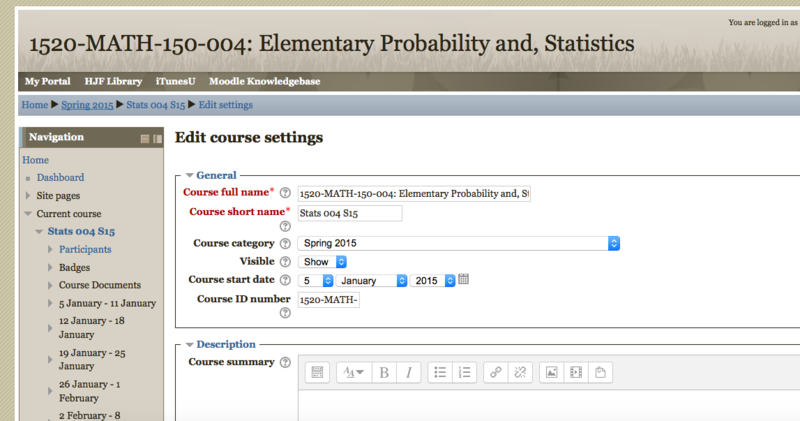 This will allow your Moodle course to auto-enroll your students into the course. Then in the Course ID copy the Term, Prefix, and Course number, and section once again. In the Course Short Name you can choose what you want to enter here. Choose the appropriate category for the term. In the Course Start Date I recommend starting the course on the Monday of the week that classes start so that the automatically generated dates go from Monday to Sunday. The rest of the options will likely work for you. The default organization is a weekly format, which seems to work well for most. From here you will go through a series of screens where you can pick and choose what you do and do not want to have import over to the new course. Once you have chosen what you want to include in the new course there is a little clean up that will be needed, specifically in any assignments or quizzes. You will need to change the due dates to the new semester because the old due dates import over. When you first create your new Moodle page there is an option to choose the course format. The most common (and default choice) is a weekly format. This will organize the Moodle page into the number of weeks that you want and includes the dates of each week. The weekly format works well if you use Moodle often to have students access resources and activities. Students can then simply go to the week in the semester and see what all is due. Another commonly used option is the topics format. This organizes the Moodle page into topics rather than weeks and does not include the automatically generated dates. A topics format may work best for accelerated Summer courses or for courses where students can move as quickly as they wish through the class (competency-type courses such as some tutorials). Can students move through the course at their own pace (or at least move as quickly as they wish)? If so you might consider the Topics format. Is it important for students to see what is due for a particular week? If so you might consider the Weekly format. Is your course divided into relatively distinct topics? A topics format may be of use to have the Moodle page align with the way your course is organized. Are there long periods of time when you will not use Moodle? Then a topics format may be better so that you don’t have empty weeks. Do you use Moodle a lot in your course? Then a weekly format may be best because there will be more ‘categories’ for you to place information and activities and these will be in order by date resulting in less searching on the part of the student for the information needed. Provide a place to store documents used in the course in electronic format so that students have access to these at any time. This can include documents such as readings, syllabi, schedules, assignments, PowerPoint slides, etc. Basically this gives students who might miss class no excuse for not having materials that were passed out in class and provides students who were in class the ability to access materials if lost. Provide a place for students to electronically turn in assignments. This is good if the assignment is easily completed in digital format (many can be, some are more difficult). Faculty can then download, grade, and turn back work electronically. There are many different options for how to turn in work, some work better for some assignments. This allows students to turn in work even outside of class (so can turn in work if miss class) and reduces the printing and paper elements of assignments. Forums allow for students to have discussions with one another outside of class. There is an art to having forums work well which will be covered in another blog post to come in the near future. If you are interested in ways to help improve forum participation, please feel free to contact me for some of these tips or visit the Educational Technology webpage (currently in progress of being built) for a list of these tips. Create material for students to complete before class. If you are interested in ‘flipping’ your class, Moodle can be the means by which students access and complete the work to be done before the in-class work. Resources such as the Book feature or Page feature can be used to deliver text, video, or other forms of media. The Quiz feature has many options that allow for different forms of adaptive testing and quizzing. If you are interested in incorporating mastery learning or adaptive testing, feel free to contact me. This allows your exams to be more of a true learning experience rather than simply an evaluation of knowledge/skill. Tests can be the best form of learning if administered in the right way. Students not having ready access to the course materials. Reclaiming lost class time turning back assignments. Encouraging/requiring work outside of class. Test grading and handwriting issues. Providing guided lessons to be completed on their own. Maintaining a grade book that students can see at any time. Reclaiming lost class time due to conference travel or other reasons for canceling face-to-face class time. This entry was posted in Moodle Basics on August 6, 2015 by christopherson.